Does anyone recognize the location for tonight’s cocktail party? Ok, I’ll tell you. This is Lake Powell, a resevoir created by the Glen Canyon Dam on the Colorado River. Yep, there is a lot of controversy surrounding that dam but no one who’s been there can argue that the vista isn’t spectacular. I was there about 3 years ago and this is pretty typical of what I saw from the window of the hotel that the National Park Serivice runs there. 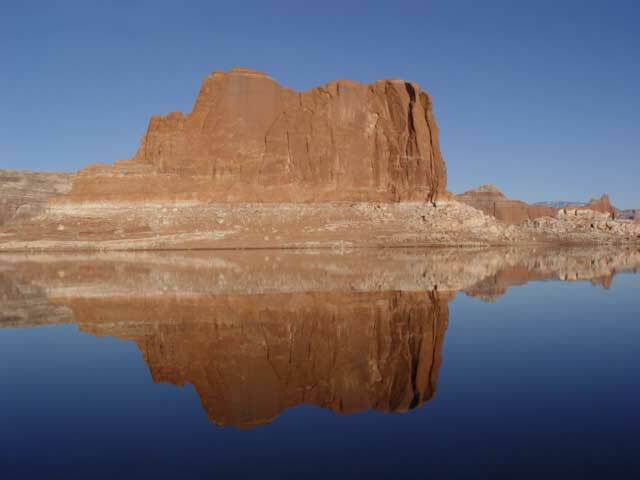 Lake Powell is a hidden gem, a beautiful juxtaposition of water and rock. The lake is long and narrow with many steep canyons through which the water meanders. You can rent a houseboat and find yourself in soaring silent cathedrals carved by wind and time. Where there is a way, the water will find it. Today, the forces behind the effort to get Hillary Clinton on the ballot as a VP gave up the ghost. It was always a long shot anyway. The last thing Obama wants is Hillary showing him up at every campaign stop and getting more thunderous applause than he does. I’m relieved that she won’t be saddled with VP. It woudn’t have been a good career move. And now, Obama is going to have to come up with some explanation for why he didn’t choose her to all of the voters who had come to expect it. He is rapidly boxing himsefl into a corner with the half of the base he has to sway to support him in November. But if he reaches out to his base, he risks alienating the independents and moderates he’s been courting. It’s always as risk when you are not guided by principle. But let’s leave Obama for awhile and have fun. Welcome to the Cocktail Party at The Scratching Post. I’ve rented a houseboat for tonight’s festivities. You can take in the scenery from the deck while Rico, our bartender with Flair! whips up his special concoction. Tonight’s special is a Cactus Tequila Collins to go with the view. We are also offereing Causmos at $10 per drink. You can choose from the PUMAPac Causmo and help Murphy pay for buses for Denver or you can help Hillary to pay down her debt with a Hillary Causmo. Of course, you can order anything you like. Everyone is welcome at The Scratching Post, including OPUMAs. But to keep people from being thrown overboard, we recommend that you leave your trigger words with Florence who is catching some rays on the sundeck. The waiters will be circulating shortly with some guacamole, salsa and empanadas. Please drink responsibly and tip your wait staff generously. Thursday: What’s on your iPod, Barack? Ludacris shouldn’t give up his day job. Math is really not his strength. At the risk of sounding racists, because I use *words*, it pains me to have to point out to Mr. Cris that almost all of the “black people” (his words, not mine) turned out at 90% strength in the primaries and Obama *still* had to steal delegates from Michigan to pull off his “win”. Now, that static population of African-Americans is about to be diluted by a bunch of hardass, redneck Republicans in the General election. Too bad Obama has made such a point of flipping the bird to half of his base. That’s a lot of territory to make up between September and November. Anyway, not my problem. Or Hillary’s either, for that matter, especially after they’ve relegated her appearance at the convention to a speech on stage with the Tea Party Ten of the Senate Ladies Auxilliary. Oh My God! Does Obama *know* these songs are on his iPod? Holy Hemiola! He’s been syncing Ludacris for years and didn’t even know how outrageously offensive Ludacris is. Well, of COURSE he doesn’t approve– now. But this has never happened to him before, except for that Reverend Wright incidence(s). Obama probably had the iPod set for shuffle. I’ll betcha the Ludacris songs never came up, what with all of the competition from the JayZ songs. Barack: Michelle, ma belle, come here quick! I was just listening to my iPod while I was on the treadmill and you will not believe the misogyny and racist crap that Ludacris is spewing these days. Did you know it was this bad? Why didn’t you tell me before I went to the iTunes store?! Barack: MICHELLE, get me that speechwriter from Philly on the horn, NOW! Cocktails tonight at 7PM EST. Hi all, Sheri Tag a NO WE WON’T is on again tonight and I’ll be filling in for Will Bower who’s got a busy schedule of his own tonight. Nancy A. will be on to discuss Obama’s ACORN connections and Sheri and I will be taking your calls on the Lanny Davis interview, Obama’s Grand European Tour and anything else you want to talk about. Join us at 8:00pm EST a NO WE WON’T on blogtalkradio. I’m not ridiculous because I’m a PUMA, though. I’m ridiculous first, because I’m a woman, and second, because I’m a woman who refuses to do what Daddy tells me to. You know, there’s just something so icky about being a woman anyway. And kind of embarrassing. I mean, I look down at my body, and I have two bumps where I don’t need them, and I’m missing a critical bump somewhere south of my belly button. Ewwwwwww, what’s that about? If only I had that bump, I could be in charge. I could do whatever I wanted to and no one would think it was ridiculous. Look at George W. Bush. This man has the manners of a pig in slop. He talks with his mouth full, he farts, he calls his right-hand man “Turd Blossom,” he gives the Chancellor of Germany a shoulder rub, he can’t keep from invading peoples’ personal space. Of course, his Bushisms are legendary. Yet is he ridiculous? Why no. For most of his horrific Reign of Error, no one in the press or the Democratic Party questioned this man’s credibility or right to be in his seat. He has that scrap of flesh hanging off his pelvis, so he must be respected. The 200,000 souls who thronged to his speech in Berlin came not just for him, he told the enthralled audience of congressional representatives. “I have become a symbol of the possibility of America returning to our best traditions,” he said. Didn’t someone in his massive entourage tell him that most of the crowd was there to catch a buzz and quick afternoon snack? I hear the brauts in Berlin are pretty good. (Can someone work on the Brauts, Berlin, Barack tongue twister? I know it’s there somewhere) The rest of the crowd was CGI generated because it looks really good in the pictures splashed across the frontpage of the NYTimes. Nawww, not our Schmoozer In Chief to be. At some point, even his miniscule conscience must start to bother him. There he is, sitting on top of the world, in front of screaming throngs, knowing that he’s a cut throat lightweight with a razor thin CV. It must seem unreal for him. It seems unreal for *me* so I can only imagine the “Oh, $#%@!” thought going through his head. If they discover that he’s a fraud, he’s done! I’d be scared out of my wits. So, there MUST be something there that the throngs want. Something that only HE can give them. Something that will make up for the incredibly vast empty sections of his resume. That’s it! He’s a symbol. And they like him! They REALLY like him. Obama’s campaign continues to flip us the bird according to this piece in the NYTimes called “Chance of Obama-Clinton ticket seen as increasingly unlikely”. I find this article particularly amusing because many of the party loyalist Democrats went over to Obama after Clinton suspended because they were convinced that he would pick her as his running mate. It made so much sense that it didn’t really need to be discussed. It was a forgone conclusion. “He *needs* her”, they’d assure me with a knowing smile. Apparently not. Either his campaign knows something that we do not, like the fact that they secretly implanted chips in our brains that they will activate on November 4 so that we all vote for him against our will, or they are the biggest collection of politically tone deaf operators we have ever seen. Don’t get me wrong. I wouldn’t want Hillary to take the VP slot anyway. But as a courtesy, they needed to publicly offer it to her to gain the respect of her voters. It was the polite thing to do. Etiquette demanded it. There is another possibility. They could be copying the “in-your-face” stylings of their inspiration, Karl Rove. Just do what you want to do and if people start complaining, kick it up a notch. BAM! What are they going to do about it? They got nowhere else to go. Well, when you put it that way, I HAVE to not vote for Obama. Otherwise, I am contributing the the Republicanization of the Democratic Party. The Obama Campaign must secretely be working for Clinton because every day they pull this kind of $#@%, I come to loathe them more and am more convinced that Hillary is the only person who can win this for the Democrats. Yep, that’s got to be it because no campaign in its right mind pulls this crap *before* they win the election. It’s just stupid. Even Karl knows that. Did Obama Steal the Primary or Did He Buy It? Of this much we are certain: he stole 4 of Hillary’s delegates at the RBC hearing. Or they were stolen for him. Either way, they were ill-gotten booty resulting in the suppression of 18 million voices. But that wasn’t enough to snag the superdelegates presumably. So many women feel that the election was somehow stolen, and by their own party, to boot. They thus feel much the way many Democrats feel about the 2000 election: bitter. When one side feels that they lost an election fairly, any bitterness recedes early on (think of the 2004 election, by comparison). But when the adjective “stolen” leaps to mind, bitterness is apt to prevail, vanquishing any desire for reconciliation and cooperation. That is what many former Clinton supporters are feeling now. (H/T to Alegre for the links). BTW, did you know that people of color have their own PUMA group? Calling them racists is probably a bit more problematic. Check it out at PoCPUMA. Chris Matthews’ pal, Gloria Boerger might have revealed the latest in the Obama and the DNC’s bizarre attempt at drawing in the Hillary Clinton voters. “Remember Hillary Clinton?” she chirps with a slight sneer when asked “for something I don’t know,” by Chris Matthews. And what does Chris not know? — That IF Hillary’s name is placed in nomination it will happen in the morning as far as possible from prime time and the bulk of American television viewers. In a throwback to that famous fight between Donna Brazile & Paul Begala when Donna came as close as possible to throwing virtually the entire party under the bus, it seems that Obama and his lackeys want to pretend that he won the Democratic Nomination through unanimous acclimation. Hillary Clinton to be relegated to a spot opposite the Price is Right?